I recently went a mini getaway for the weekend and decided to pack light. 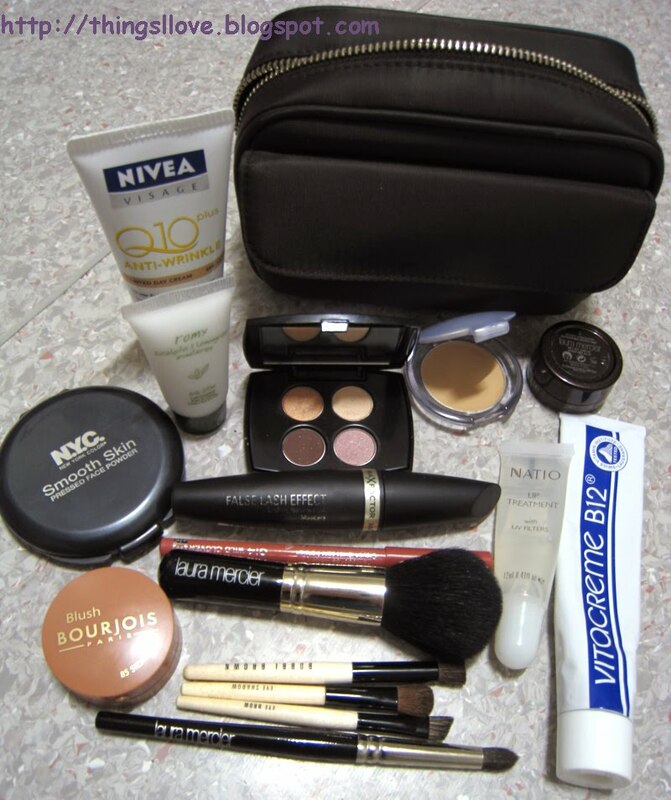 I only brought one small toiletry bag with my makeup essentials and a few makeup brushes. 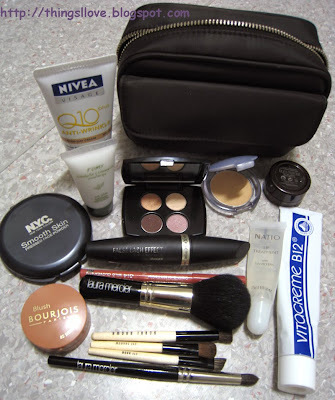 In my attempt of practising a minimalist approach and due to haste, I forgot a few key items and my beauty routine looked like it was going to go awry for the weekend. Thankfully, after calming down from the initial shock and horror of the forgotten items, I realised that I did have all the key items in my tiny bag, even if I had to improvise a little. Grab a tube of your body lotion and apply a thin layer of your body lotion or cream, and rub into face in a circular motion, this will remove makeup, and oil with ease and then rinse off to leave face soft and also moisturised. For the delicate eye areas, remember to be gentle and if you have cotton balls handy, pop the cream on the cotton ball and then wipe it gently across your eyes to remove shadow colours and mascara. If you do not have body lotion handy, use your moisturiser or even hand cream instead as this cream cleansing method can always be used to clean your skin. I have very sparse brows and absolutely must darken my brows to provide a frame for my face if I want to look anything decent and was quite horrified when I realised that I didn't bring my trusty brow pencil and began hunting around my bag for a substitute. Usually in such situations, I would use a deep brown/black or grey eye shadow to fill in my brows but my mini Lancome eye palette were filled with light bronze and mauve colours that was not going to suit brow use. 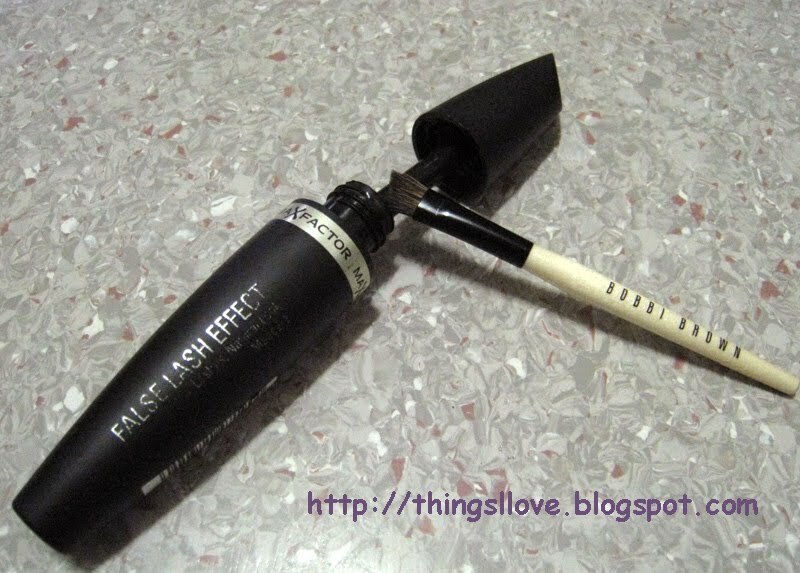 The only dark item in my kit was my Max Factor False Lash Effect black mascara. Desperate times calls for desperate measures right? Well it worked at treat. Lightly wipe a brow brush against the wand of the mascara (a cotton swab could also work), and after brushing off excess colour onto the back of hand, use the remaining colour on the brush to fill in brows. It stayed on for the entire day and looked as natural as my normal brow pencil (this would obviously not work as well if you have light hair colours but you could probably get away with a brown mascara). Or you have just plain forgotten and you have a lip liner handy, just line your lips and fill in lips with your lip liner. Blot with a tissue and then apply a lip gloss/balm on top for glossy lips that are coloured and well moisturised. Another substitute for lip colours are creme blushes lightly patted over lips followed by lip gloss. I think next time I'll create a list to tick off when I go away to avoid forgetting key items but it was good to know I had trusty beauty products that could double up in use in times of needs. What other unconventional uses do you have for your beauty products? Hair product can be substituted with any of these: lip balm, lip gloss, vaseline, pawpaw ointment, body lotion, face cream. I've used lip balm for healing dry patches on elbows/nose, lipstick as blush, etc. Also for traveling, i like to pack old or rejected face creams to use as body lotion - usually packed smaller than body lotions and all the potent ingredients work a treat! great post!! I don't pack light when it comes to beauty, but I almost always forget tweezers.. I've learnt to stockpile freebie sachets of moisturisers / shampoos / conditioners etc & leave in a ready to go toiletry bag or even my overnight bag (I only own the 1 so it's easy for me). I've amassed quite a few gift with purchases that included branded toiletry bags (like clinique etc)so I utilise these & just leave them prepacked with stuff I wouldn't use everyday but would be fine for a weekend away....saves so much time packing wise & it's fun to use some different products! I've tried the lippy trick Jadegrrrl and its great. Sharonpakir - great advice. I do the lipbalm tip too especially when I'm sick with the cold. Akisa - I usually pack more as well but thought an overnight stay didn't warrant the extra baggage but I guess I was wrong. Melbournite - GWP and sample size products are the best. I have a tonne of them at home but forgot to bring everything last weekend. I hope I won't forget for this weekend when I go down to Rye.